If we do update an answer you can read about it here and we will also be making appeals for answers or further information on this page so be sure to check back every once in a while. We start with a success story from a question that we half answered in Ask Clarets Mad 3 and that is the naming of the Ajax team that played at Turf Moor following our successful 4th Division Championship season of 1992. Some of the better known players such as Bergkamp and the De Boers were with the Dutch squad for the 1992 European Championship finals but at least 3 of those playing at Turf Moor have gone on to be very successful and we can finally put names to faces. The above is a photograph of the starting eleven. On the back row we have: Edwin Van der Sar, Marciano Vink, Sonny Silooy, Dan Peterson, John Hansen, Michel Kreek. 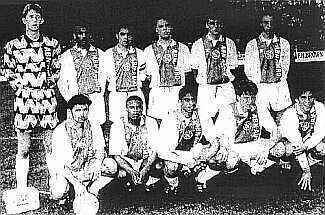 Front row: Rob Alflen, Edgar Davids, Martin Reiziger, Alfons Groeneddijk, Ron Willems. Thanks go to Dutch Claret Paul Valentin for this information who would like to point out that he is in no way a supporter of Ajax but he did do a great job considering the poor quality of the photo. So far we’ve not done too badly on the questions but there are a couple or three we are struggling with. Firstly we have had a request for information about a friendly played at Turf Moor against Hamburg circa 1950. The person who asked the question was at the game and remembers Hamburg’s strip of white shirts and red shorts and also that their trainer ran onto the pitch carrying a suitcase! If anyone can point me in the direction of the date I should be able to do the rest. Just for the avoidance of doubt this is NOT the European Cup match played a number of years later. Update, we have now answered this question with the full details appearing in Ask Clarets Mad 5. We have also been asked what ALL of the members of the 1991/92 Championship side are doing now which is currently on Ask Clarets Mad 4. At the moment we still require information on David Williams, Ian Bray, Peter Mumby and Paul McKenzie with any updates on the others being welcomed. There was definitely something in the ether a few weeks ago when within the space of a couple of hours we received requests from 2 different people asking about old Clarets match videos. One was concerning The Orient Match and the other the 1962 FA Cup final neither of which are currently available for sale. We passed the request on to Burnley FC who are currently making enquires in to the matter but it is rather a complex subject with copyright involved etc. however there is a possibility that one or both of them could be for sale at some time in the future with The Orient Match looking more likely. If you have any information or possibly a copy yourself we would be delighted to hear from you. One particularly sad update we can bring you relates to the question in Ask Clarets Mad 1 about how many surviving members there are of the 1947 Cup Final team. 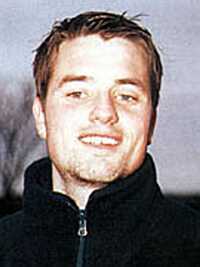 Unfortunately Jackie Chew passed away in October 2002 and Billy Morris died on New Years Eve 2002 meaning that there are no surviving members of that team. 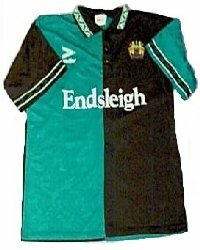 Ending on another update we previously said in Ask Clarets Mad 1 that Burnley never won a game in the jade and black away strip of season 1993/94. What we meant to say, of course, was that we never won a LEAGUE match as we were successful in the colours just once in winning an FA Cup 1st round replay at York City. Thanks go to Phil Allanson for that one. This page will be updated as and when we receive any updates and any help you can provide would be very much appreciated. As we’ve said previously please don’t hesitate to contact us with any query large or small. Perhaps I should add the disclaimer that any requests for information on an entire 27 man sqaud will be frowned upon!